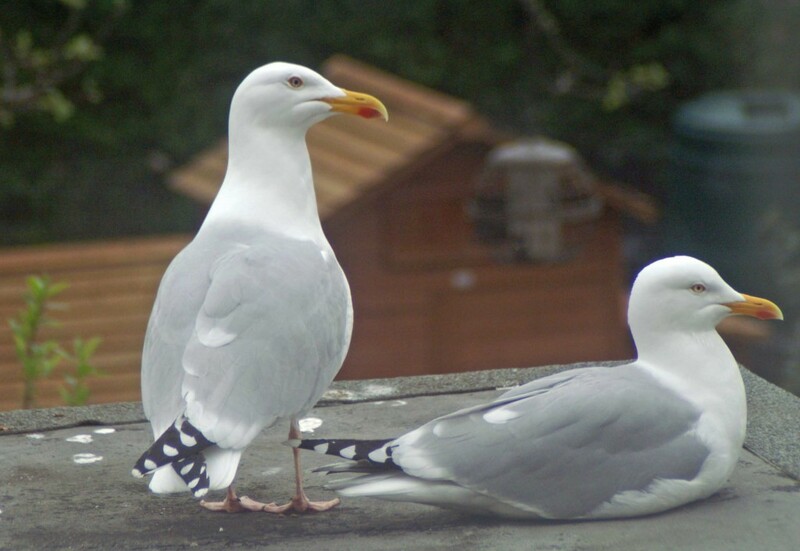 A pair of Herring Gulls are regularly visiting the flat roof immediately below the window of the bedroom I am staying in. At the moment they are not roosting here overnight, but they arrive back early each morning, announcing their arrival with much raucous calling and strutting around. I have been very aware of Herring gulls locally, flying around, perching on rooftops and up amongst the chimney pots, but put it down to being so close to the seashore where there appears to be plenty of natural food. However it would seem that a number of pairs have claimed several of the chimney-rich sites as nest locations. Their strongly territorial and aggressive-defensive behaviour makes them difficult and, sadly, dreaded birds to have as close neighbours, which is a pity as when viewed closely and unemotionally, they are very clean-looking and handsome birds, if a touch arrogant in demeanour. The Herring Gull is one of the commonest gulls of Northern European coasts, bigger than a Common Gull it has rather fierce-looking pale eyes with a yellow iris and pink legs and feet. A visit to the seaside wouldn’t be the same without the sound of gulls, but when they are intent on sharing your house, you rather wish they’d turn the volume down. A very noisy bird it makes a variety of squealing notes, sometimes sounding like it may be chuckling and also producing some quite dog-like yelping and ‘barking’ sounds. The male gull brought in some strange ‘tokens’ for his chosen mate, a turkey-leg bone and a fairly large piece of stone amongst them, and they began to display bonding behaviour, the female ‘begging’ for food, and greeting one another vocally and with body contact. I am very interested in the ways in which wildlife interacts (and learns to exploit) people and although I had no previous experience of living this closely to them, I was aware that herring gulls had a reputation for some anti-social behavioural traits. We had a chat with the next-door neighbour, who related her previous experiences with locally nesting gulls that could have come from the Hitchcock horror story. She alleged attacks made against herself, her visitors and particularly her dog, whilst minding their own business in their own garden! She had rung the RSPCA who had told her there was nothing she could do as the birds were protected, and that the nuisance would only last for seven weeks while the birds were nesting! ” The European Herring Gull is an increasingly common roof-nesting bird in urban areas of the UK. The Clean Air Act of 1956 forbade the burning of refuse at landfill sites, providing the European Herring Gull with a regular and plentiful source of food. As a direct result of this, European Herring Gull populations in Britain sky-rocketed. 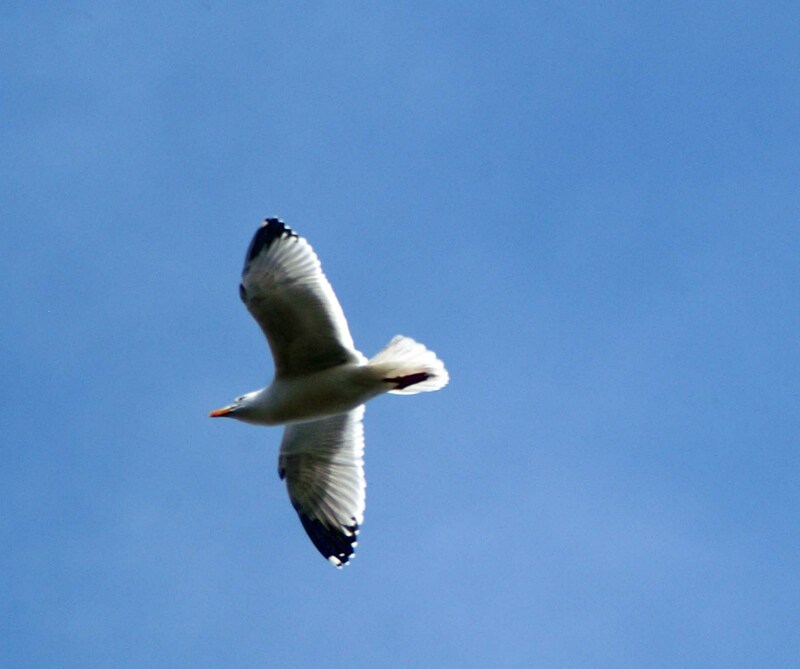 Faced with a lack of space at their traditional colonies, the gulls ventured inland in search of new breeding grounds. Dwindling fish stocks in the seas around Britain may also have been a significant factor in the gulls’ move inland. The gulls are found all year round in the streets and gardens of Britain, due to the presence of street lighting, (which allows the gulls to forage at night), discarded food in streets, food waste contained in easy-to-tear plastic bin bags, food intentionally left out for other birds (or the gulls themselves), the relative lack of predators and readily available, convenient, warm and undisturbed rooftop nesting space in towns and cities. Particularly large urban gull colonies (composed primarily of European Herring Gulls and Lesser Black-backed gulls are now present in the cities of Cardiff, Bristol, Gloucester and Aberdeen to name but a few. The survival rate for urban gulls is much higher than their counterparts in coastal areas, with an annual adult mortality rate of less than 5%. It is also common for each European Herring Gull pair to successfully rear three chicks per year. This, when combined with the long-lived nature of European Herring Gulls, has resulted in a massive increase in numbers over a relatively short period of time and has brought the species into conflict with humans. Once familiar with humans, urban European Herring Gulls show little hesitation in swooping down to steal food from the hands of humans. 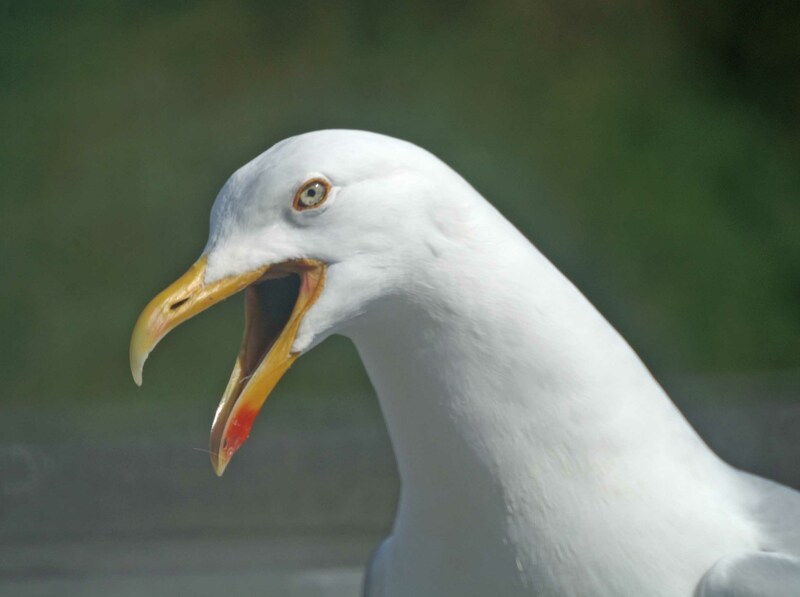 During the breeding season, the gulls will also aggressively ‘dive bomb’ and attempt to strike with claws and wings (sometimes spraying faeces or vomit at the same time) at humans that they perceive to be a threat to their eggs and chicks — often innocent passers-by or residents of the buildings on which they have constructed their nests. Large amounts of gull excrement deposited on property and the noise from courting pairs and begging chicks in the summer months is also considered to be a nuisance by humans living alongside the European Herring Gull. Non-lethal attempts to deter the gulls from nesting in urban areas have been largely unsuccessful. The European Herring Gull is intelligent and will completely ignore most ‘bird-scaring’ technology after determining that it poses no threat. 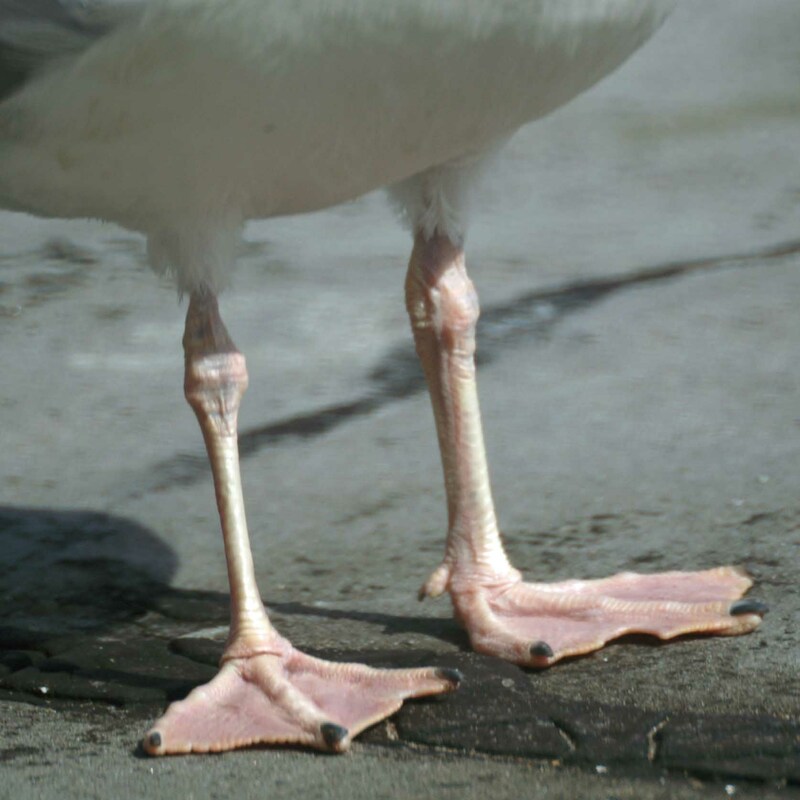 Rooftop spikes, tensioned wires, netting and similar are also generally ineffective against this species, as it has large, wide feet with thick, leathery skin which affords the seagull excellent weight distribution and protection from sharp objects (the bird may simply balance itself on top of these obstacles with little apparent concern). If nests are removed and eggs are taken, broken, or oiled, the gulls will simply rebuild and/or re-lay, or choose another nest site in the same area and start again. Attempts to scare the gulls away using raptors are similarly ineffective. Although they are intimidated by birds of prey, European Herring Gulls, in addition to being social birds with strength in numbers, are large, powerful and aggressive as individuals and are more than capable of fighting back against the potential predator, particularly if they consider their chicks to be at risk. European Herring Gulls are also naturally accustomed to predators (such as Skuas and Great Black-backed Gulls) living in the vicinity of their nest sites in the ‘wild’ and are not particularly discouraged from breeding by their presence. 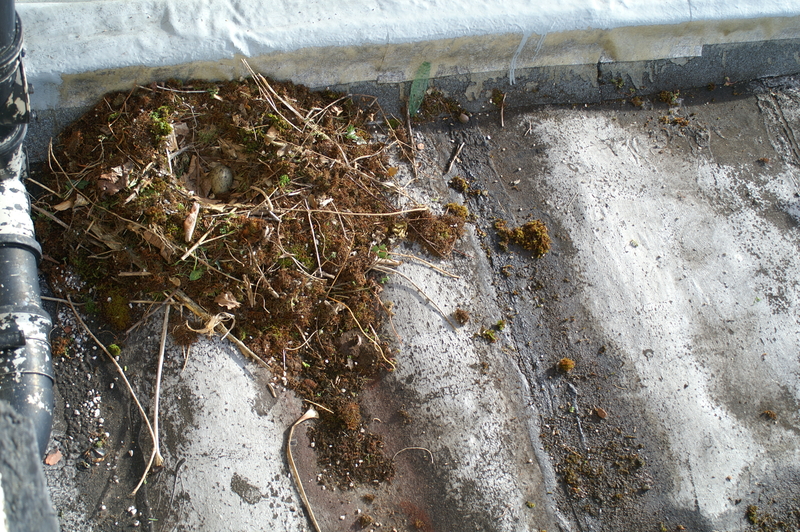 It would seem that there is no easy quick-fix solution to the problem and currently not a lot you can do if the birds take a fancy to nesting on your roof, there doesn’t seem to be a great deal of advice or help available to householders either, a bit worrying bearing in mind that many of them won’t be aware of the law. During the late 1800s a man in Llandudno constructed wings from gull feathers and string and tried to fly. He failed. 😀 Sting in the tail there…are these your photos? They are truly fabulous. They sum up this most rambunctious of species beautifully. I love them, except when they start modelling Alfred Hitchcock’s Birds and trying to nick childrens’ ice creams on St Ives beach…. Thanks for your kind words – I love their swagger too, but they’re not the most considerate of neighbours!Had a quick peek at your site-I’ll be back.